We Cordially invite you to the Opening of our travelling Retail Concept '100 DAYS' BERLIN. Tomorrow the 30th September 2011, we are opening up a temporary shop at Rochstr. 3 in Berlin. The store which moves around the world, remaining for 100 days per season in a certain city, reflects the current show and theme of Vibskov‘s collections. "Inspired by all the travelling, and by not committing to a long term lease, we are free to experiment with spaces and installations and present the full collection - including showpieces, one-offs and pieces that were edited out of the collection before the show." The first venue to host 100 DAYS was Amsterdam's SPRSPACE, taking off in the universe of the The Last Pier Pandemonium Show in December 2010. 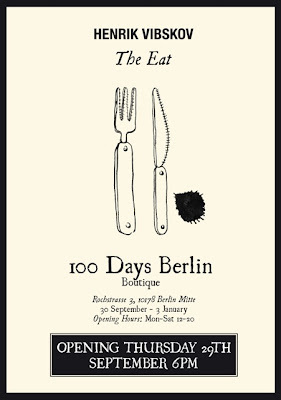 Now the 100 DAYS store has arrived in Berlin, presenting the current AW11/12 collection The Eat. Rochstrasse 3 is situated in the center of Berlin Mitte, where also fellow Danish Designer Wood Wood is located - an area known for its unique stores, cafes and galleries. The 100 DAYS store aims to bring the whole experience of The Eat to Berlin by deconstructing the show's installation and redesigning it to fit the temporary retail environment. Thus, the customers will be able to enjoy the full universe of Henrik Vibskov. Come by for a drink and celebrate with us - Looking forward seeing you! The 29th of September 2011, 6pm at Rochstr. 3 , 10178 Berlin-Mitte. From then on the store will be open Mon-Sat, 12.00 - 20.00 pm. I am glad to find this article. You can click this to read my thoughts on your blog.